This is the second year of the Puffin Awards for Literary Excellence, a short-story competition for high school students in Victoria County, Cape Breton. This Friday, April 17th, we will be holding a fund-raising event at St. Michael’s Parish Hall in Baddeck. There will be readings, songs, an interactive story circle, panel discussion, and open mic for readers, all under the direction of Master of Ceremonies, Gary Walsh (Cabot Trail Writers Festival). 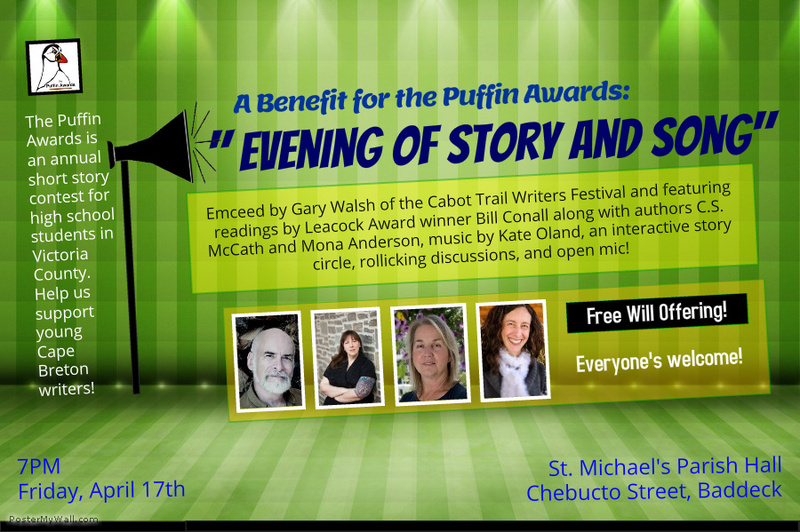 Join Cealligh MacCath, Mona Anderson, Kate Oland and me for a fun(d) evening in support of young writers.